Greyhound dogs, a breed that can be polarizing. Almost all of the Greyhounds that you see as pets came from the racetrack. They ended up at a Greyhound rescue organization because they either retired from racing at four to six years of age or because they never made the cut and therefore can be very young. As with every breed, there are good points and some things that can be challenging. This is why they are so polarizing. For more information on the breed please see this great article on the 10 reasons you don’t want the breed and 10 reasons you do. I wish there were more articles like this for every breed because all dog breeds have pluses and minuses. One of the biggest controversies about Greyhounds revolves around rescuing them. One school of thought says these dogs need to be rescued and placed in forever homes or else the racers will euthanize them. Sadly, these dogs are usually euthanized when they are not rescued. Another mindset says that racing Greyhounds is unnatural and inhumane. Further, the environment they are required to live in while of racing age can be abusive. Rescuing the retired racers and those that didn’t make the cut only makes it easier for those racing these dogs to readily dump their dogs when they are done with them, recruit yet more young dogs and give the Greyhound racing community an air of legitimacy. I fully understand both camps. One could make a compelling argument either way. Back to the original question of this article - Why do Greyhounds wear muzzles when they race? Let me be clear about something before I answer that. Greyhounds normally only wear muzzles when they race; as a family pet this is rarely necessary. Greyhounds are normally just big sweethearts that are very happy to snuggle with you on the sofa for hours on end. They are also pretty good runners too if you haven’t noticed. They are visually stimulated by prey (they officially are a sighthound) and therefore must always be kept on a leash as pets because they will go from 0 to 45 miles per hour in about two seconds to chase a paper bag blowing down your street. Speaking of running. Am I the only dog lover who is in awe at the site of a Greyhound, or any dog for that matter, at gallop speed? God knew what he was doing when he gave canines this ability - beautiful! When Greyhounds race they get extremely stimulated and aroused. When they are excited like this their bodies are flooded with epinephrine (i.e., adrenalin). Humans have this same reaction to high levels of stimulation and arousal. When they are flooded with epinephrine they can sometimes bite the dog racing next to them. This is called redirected biting and all dog breeds can do it. It’s nothing personal; they just don’t know what to do with their excitement. Think of the football team that just made the winning touchdown and the players are hitting and pushing each other around - and they are on the same team! The other reason Greyhounds wear muzzles when racing may surprise you. It is not uncommon for there to be photo finishes in these races. If there are a number of dogs with their pointy noses crossing the finish line at the same time it can be difficult to see who won. Muzzles make it much easier to determine the actual winner. Greyhounds are sweet, gentle and athletic dogs. It is common to see Greyhound owners who would have no other breed because they love them so much and have owned a number of them. Greyhound rescue groups can be some of the most enthusiastic and dedicated organizations in the dog world. Barking is a completely natural behavior for dogs, but humans don’t always appreciate it. What many people don’t know is that the act of barking can be a self-rewarding behavior for dogs – thus we need to get it under control as it typically only gets worse. In your dog’s mind, however, there’s a good reason to bark so the first thing to do is figure out why she wants to bark in your back lawn. It’s always best to find the root cause, if possible (e.g., neighbor’s dog, loud construction noises, etc. ), and manage that. Keep her indoors rather than leaving her outside all day. I’m not a big fan of leaving dogs outside for extended periods for a number of reasons - chronic barking is just one of them. She won’t bark at what she does not see or hear. Play some music, television or radio, loud enough to cover outside noises. Get her crate trained if necessary. Ask a dog training professional for help if your dog needs to be crate trained. If there are holes in your fence that she finds too irresistible, block them. If you have a chain-link or wrought-iron fence, change the fence so that your dog can’t see through it or, at the least, create a section that blocks her view and confine her in it when she is outside. Safely tether your dog on a 10-15’ long-line while she is in the back lawn. Only tether your dog while you are present in the back lawn. Spend time with her out in the back lawn and reward her with tasty training treats when she is quiet – completely ignore her when she is barking (don’t look, don’t touch, don’t talk). Over time she should generalize this behavior to all of the back lawn and not just when she is tethered. Continue to reinforce her for not barking – even once she is off the tether. 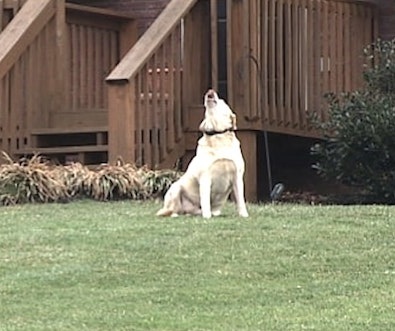 If your dog seems to be barking at nothing, she’s likely bored - you may be leaving her in the back lawn for too long. Boredom, due to lack of exercise and mental stimulation, is probably the biggest reason for excessive barking. Think honestly about whether your dog is getting enough mental and physical exercise. There are many dog toys that are stimulating and appropriate for the back lawn – ask a dog trainer for suggestions. A young, energetic dog craves lots of exercise and attention from you and with you. Thirty minutes to an hour of exercise (e.g., a structured walk) in the morning will go a long way toward helping your dog settle down and lessen barking. Food puzzle toys and hollow rubber toys that can be stuffed with treats or kibble are great entertainment for dogs. They give your dog something fun to do while she is in the back lawn. It’s okay, even desirable, if she gets most of her meals this way. Ask a knowledgeable dog behavior consultant for suggestions on appropriate puzzle toys and food toys. Does your dog bark for attention in the back lawn - or even inside the house? This is known as attention barking or demand barking. You can tell she’s doing this because she’ll be looking at you when she’s barking. Don’t give her any attention when she does this (don’t look, don’t touch, don’t talk). None at all. Even stern reprimands count as attention. She has no idea what “quiet” means if this cue hasn’t been taught to her; yelling “quiet” will only make it worse. She’ll think you’re joining in the barking game and she’ll also have been successful in commanding your attention. Reward her with your attention when she’s calm and not barking and ignore her when she demand barks to get her out of the demand barking habit. Teach a cue (i.e., command) for being quiet. This is a good trick to have in your dog’s bag for when she’s out in the back lawn. Have some high-value training treats ready – small and soft so they can be eaten quickly by your dog. While your dog is barking, just wait for her to stop. When she does stop, wait a second, praise, and give her a treat (you can also teach this using a clicker). Gradually increase the time she must be quiet before rewarding her. If she starts barking during this training, completely ignore her (don’t look, touch or talk) and obviously don’t give her a treat. Be patient and increase the duration very slowly. Once she seems to be understanding, add a cue word such as “hush” or “quiet” when she stops barking. It is unreasonable to expect your dog to never bark as barking is the way dogs communicate with the world, but you can teach her some control using these techniques. We all have things that people do that make us crazy. For example, some of us can’t tolerate it when people put on makeup in a public place (that one doesn’t bother me), others find it disgusting when restaurant employees don’t wash their hands after going to the bathroom (that one bothers me), and there are those who come unglued when people crack their knuckles (I’m neutral on that one). Bella (the dog) thinks: What in the heck was all that? Bella thinks: There had to be a less traumatic way to move me over here next to my owner. Owner says: Bella (much louder and rapidly), I said “stay!”, “stay!”, “stay!”, “stay!”, “stay!”, “stay!”, “stay”! Bella thinks: I’m confused and my owner has turned into a nervous wreck. What does he want and what is going on? Bella thinks: That really hurt! I’m getting really stressed now because I have no idea why I’m being harmed and why my owner has become a berserk drama queen! Sadly, this is a fairly realistic and not uncommon type of dialogue between dog and owner. I see versions of it all the time. I don’t believe most dog owners are intentionally trying to make life difficult for their dog when this kind of thing transpires. They just haven’t thought through how this is being processed by their dog. I’ve provided a few simple rules in order for you to avoid this type of transaction (and poor relationship) with your dog. Basically these tips ask you to do less with your dog, but do things smarter. Say commands or cues in a soft pleasant voice, say them once, and give the dog a second to comply. Many dog owners are guilty of quickly giving too many commands to their dog. Remember, dogs don’t understand human language; multiple rapid-fire repeated commands confuse them. Think of the stereotypical international tourist loudly yelling and repeating words in a language that the listener doesn’t understand. For more on this see: Should you give your dog a command only one time? Quit giving your dog so much leash input. I’ve found that most dog owners are unconsciously and constantly giving their dogs way too much and unnecessary leash input when their dog is on leash. This is known as micro-managing the leash. Imagine having a collar around your neck that was attached to a leash held by the Jolly Green Giant. How would you feel if he continually gave you little tugs and pulls every few seconds in all different directions? At the least you would soon start to ignore this significant annoyance; at worst, you would get very stressed and confused. Soften your arm when you walk your dog, become aware of what you are doing with the leash and provide leash input only when needed and do it gently. Stop the “leash corrections” and other types of physical punishment; it’s not 1950 anymore. We all know that physical punishment to a dog (and humans for that matter) has all kinds of destructive long-term consequences. Human and canine behavioral science has taught us a lot about this over the last 25 years. We’re a lot smarter these days. There are easier and less distressful (for both dogs and humans) ways to teach your dog what you want him to do. For more information see: Don’t do to Your Dog What Some People do to Their Children. Fine tune how you interact with your dog by doing less while getting better results.